Fatigue, runny noses, headaches — they’re the cold symptoms slowing down our day, preventing us from enjoying the things we love. Don’t let these symptoms get you down this winter. 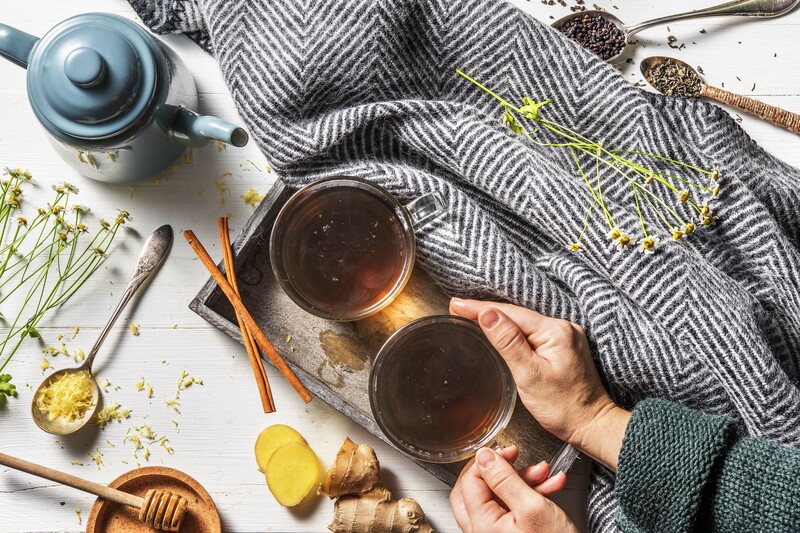 Try these cold remedies, ones that actually work! Every year it’s the same (c)old story. Forget your scarf one day or shake the wrong hand and bam — you find yourself waking up with the chills, a sore throat, and zero energy. To help, we’re sharing a few anti-cold and flu tips to get you through the season. It sounds simple, but this is the cold remedy to end all cold remedies. Sporting a refillable water bottle isn’t just a summer trend. In the winter, hydrating is just as important, if not more so, when the dry, cold air hits. 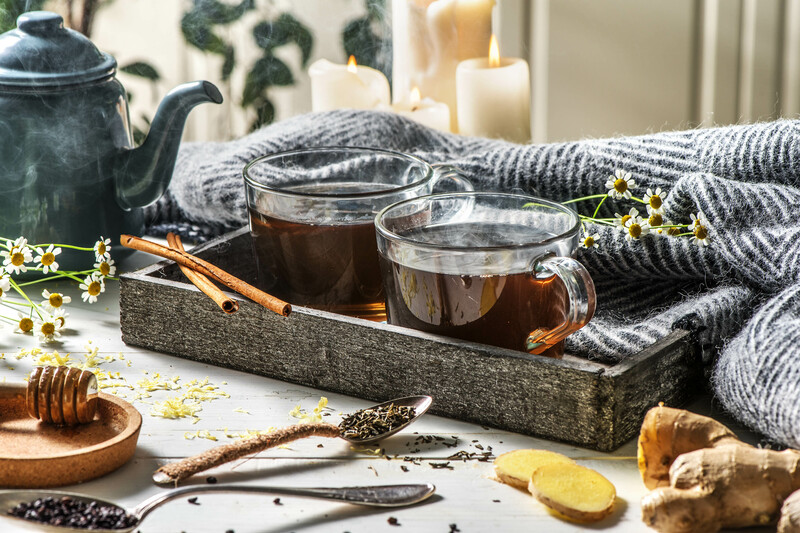 A tea or herbal infusion will help keep you warm and, depending on the ingredients, can even buff up your immune system. Our favourite: the Immune Booster Tea. It’ll be your best friend when fighting back germs! Mix the dried elderberries, cinnamon and green tea. Infuse 1 to 2 tablespoons of the tea mixture in boiling water for 2-3 minutes. Add 2 slices of fresh lemon and 3 slices of fresh ginger. Curl up under a blanket and enjoy! When it’s cold outside, we tend to stay in — choosing the couch over a walk through the snow. Yet fresh air and light exercise is so important for staying healthy during the shorter, winter days. Ventilate your home by opening windows every day, or go on a short walk — especially on a sunny day when your body can replenish some Vitamin D. So take a stroll to your local coffee shop or library. The fresh, outdoor air will boost your energy and l help clear out your lungs. 3. Vitamin C, more vitamin C! Vitamin C is your number one ally when fighting off viruses. Known for stimulating the body’s defenses, Vitamin C is the cheerleader to your battling immune system. Need a delicious way to incorporate more Vitamin C-rich fruits and vegetables into your diet? Smoothies! 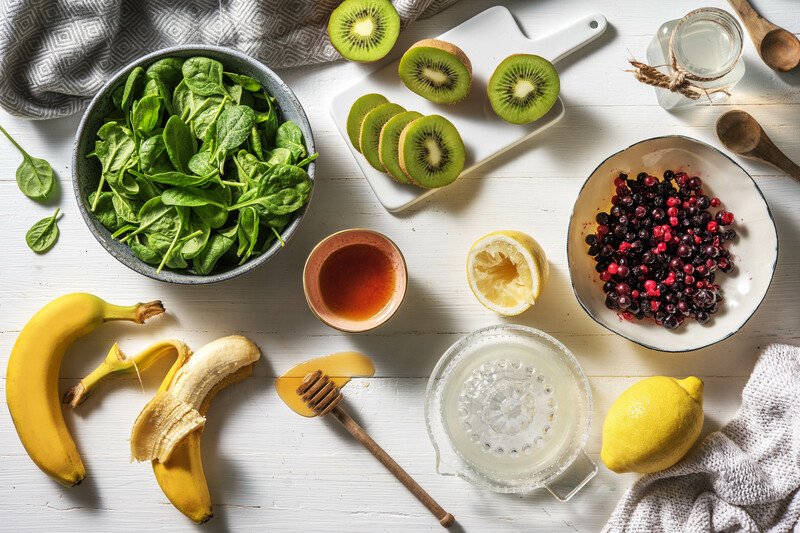 Our Immunity Booster Smoothie is filled with nutritious ingredients and best of all, it’s delicious. Peel the kiwis and bananas and cut into pieces of equal size. Using a blender, mix all ingredients for 2-5 minutes or until a smooth, liquid texture is achieved. If the smoothie is too thick, add a little coconut water and mix again for 1 minute. Take a sip and treat yourself! There’s no beating a classic. One of the best way to warm up is still with a hot, comforting bowl of soup. Filled with tasty veggies, a big bowl of soup is delicious and can help with congestion and caused by colds or flus. Nothing can beat your mom’s chicken noodle recipe, but we’ve got a pretty good backup. It’s basically a miracle in soup form. Peel and cut carrots, celery stalks and onion into 1/4 inch slices. In a large saucepan, heat olive oil over medium-high heat. Add the carrots, celery and onion and cook for 7 minutes until fragrant. Stir regularly. Add chicken broth, bay leaves, thyme, oregano and pepper to taste. Bring to a boil, then let simmer for 5 minutes or until vegetables are tender. Add the noodles to the soup and bring to a boil for 10 minutes, or until they are cooked. If the soup seems too thick, add a little broth, or water. Add chicken, parsley, lemon juice and boil 1 to 2 minutes or until chicken is hot. Season with salt and pepper to taste. With these tips and simple cold remedies you’ll be able to leave the tissue box behind. End this cold and flu season at your best — and that’s nothing to blow your nose at.